Usage in game: When you need both high maneuverability and high Pilot Skill, maybe an alpha strike. Breakdown: At a glance, folks who haven't flown A-Wings much may balk at Tycho Celchu. I mean, yeah, he's Pilot Skill 8, which is awesome, but he's flying an A-Wing and costs 26 points- same as He-Who-Bestows-A-Focus-Token, the ever-popular Garven Dreis. So, is he worth it? Let's look at the differences. First and most obvious, Dreis is in an X-Wing while Tycho's flying an A. Stats-wise, an X-Wing is the more capable ship, but A-Wings have a pretty ridiculous amount of movements available on their dial, and for folks who play this game rather than talk about points and stats in a vacuum, that's worth a lot if you know what to do with it. 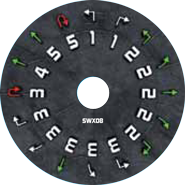 The always courteous Fantasy Flight Games actually posted the A-Wing maneuver dial when they did their Wave 2 preview. Look at all those green maneuvers and only 2 red maneuvers. A-Wings seem to be really good at getting rid of Stress Tokens, so how much is Tycho's card text really worth compared to a Green Squadron Pilot who costs 7 points less if A-Wings are so easy to fly when Stressed? Well, first, you're getting an increase of Pilot Skill by 5 points- a not insignificant amount. Tycho's going to shoot before everyone but the best pilots where that Green Squadron A-Wing is going after not only the mid-level pilots, but even behind some of the lower tier guys. Let's dig deeper though- there's gotta be some reason Tycho's got the card text he does, right? Remember awhile back when I talked about Push The Limit? For 3 more points, Tycho basically becomes Vader in a more maneuverable ship with one less hull and Boost instead of Barrel Roll. Funny how when you put it in those terms, 29 points for an A-Wing doesn't seem so expensive does it? Ok, so that's what everybody puts on Tycho, but you gotta be different. Are there any other Elite Pilot Skills that are fun? Well, as you see in the above pic, A-Wings have the hard 1 turn available as a white maneuver, so coupled up with Daredevil and Tycho's high PR and you've got a real, the hunter became the prey style table-turner on your hands. As Tycho's in an A-Wing, he can also do a 5 straight. Two ships fairly close to being in line with each other across the table, both moving 5 straight end up being in Range 3 of each other after they both move from their initial deployment, but you (hopefully) will get to fire first because of Tycho's high PR. Take Focus for your Action (or better yet, get one from a buddy like Dreis or Lando and declare Target Lock for your Action), then as the Combat Phase starts, fire your Homing Missiles at some really annoying pilot on the other side of the table at Pilot Skill 7 or less. An unsuspecting opponent may not have even declared a first-turn Action, or might have declared Evade as he probably wasn't planning on you pulling that. All the other Rebel ships top out at 4, which if my placement is right, leaves a ship just short of Range 3 even if the Imperial moves a straight 5. Maybe you don't off the victim outright, but then again, maybe you do since he can't spend Evades against those Homing Missiles and you're denying him that bonus Defense die firing a Secondary Weapon. Four Attack dice against 3 Defense dice? Yeah, I'll take that trade off any day of the week, especially if we're bustin' on some ship that doesn't possess a Secondary Weapon System of it's own to shoot back if it survives. Might not work after the first time you use it, but there again, having Tycho on your sidelines might be enough deterrent to delay those Imperial ships from roaring forward, which aside from the Firespray, tends to mess up their game plans to at least some degree. Might be worth it just for the threat factor, never mind the rest of the game that Tycho brings to your list. All that said, A-Wings aren't for everybody. They're tougher to use effectively than X-Wings and definitely tougher to use than a YT-1300. They don't have the guns to reliably down enemy ships on their own and don't have the hull or shields to withstand the consequences of careless maneuvering. Me personally, I've had the most luck using A-Wings as the trailer ships finishing off whatever an X-Wing didn't kill on it's first salvo. Tycho would be absolutely murderous following around Wedge in this manner, especially if they're packing Stealth Devices or Shield Upgrades, or supporting the somewhat less offense-oriented Luke Skywalker, X-Wing Pilot. It wouldn't be cheap, but look at it this way- you don't have to install Swarm Tactics on Wedge or Luke to get that plan to work pretty effectively and that either frees up a couple of points or their Elite Pilot Skill slot, how ever you want to look at it. I'm not sure I like daredevil on Tycho - it doesn't seem to really play on his ability at all. Certainly, the one plus about daredevil with Tycho, is that you don't have to choose a green maneuver to get rid of the stress to do a regular action - so he is less predictable than any other a-wing with a stress token. Yeah, like I said in the article- Tycho's *ability* isn't what makes Daredevil fun on him- it's that he can do 1 hard turns at Pilot Skill 8. There's a pretty small amount of ships that would be able to react to that in any way other than getting shot up. You could do a K-Turn instead, then Boost, as you mention- it just depends on the context, I guess in reference to the position of the trailing ship to Tycho, other ships near the area you'd attempt the K-Turn, or a board edge as to whether or not it'd work better than just doing a 1 turn then Daredevil. Again, the obvious upgrade for Tycho is PTL- I'm not debating that here, nor was I debating it in the article above- my apologies for not being clear enough to leave you with that impression. I just wanted to try and present some other options for folks who want to change it up now and again for something different. Tycho with a homing missile and PTL is the perfect cure for a howlrunner centric squad. Used it last time I played and took out howlrunner by the second turn (granted, I had 4 Hits with the missile, and the other guy rolled pretty badly but still, not bad). I think using him as an assassin would be a very good use. Use the high speed and agility to take out fighters that are crucial to the opposition. I gotta say, reading the various Regionals accounts online this week, I was surprised to see so many people still running TIE Swarms with Howlrunner. There's nothing wrong with that, obviously, but now that everyone and his dog has faced them 10,000 times since what, last October? We all know how to beat them and who to go after.